I can’t complain of my first experience flying alone with the two kids. Although it was a very short flight I was a little bit concerned on how they, or rather I, would deal with it. We flew Garuda Indonesia since we’ve had several bad experiences with Air Asia Indonesia. The service was excellent. I love how they give you a special meal for the baby and a little bag with diapers, wipes and a little toy. The only other airline I’ve flown with similar perks is Emirates. My only regret was taking a late flight. We decided to fly at 8:50 PM because I didn’t want to miss the kid’s playgroup and class at Kindyroo and because the flight was a bit cheaper. We ended up paying about 1.5 million rupiah per ticket plus 250,00 for Joshua’s. Not bad considering I bought them 3 days before leaving. Anyway, about the late night flight, Joshua was very tired and had a very hard time falling asleep. Every time he heard a noise, he would wake up and start crying very loudly. Thankfully this only happened before we boarded and by the time we were on the plane he was sleeping like a baby. Evan did amazing! I was so proud of him. I didn’t take a stroller and only had the carrier for Josh and Evan was a great sport walking all over the place and helping me by handing the tickets at the counter and always checking how Josh was doing. Again, the problem with flying late at night is that by the time our flight landed Evan was sleeping. I tried everything to wake him up and he would just melt back into the seat. Since I had Josh in the carrier I was not able to carry both out. A very nice gentleman helped me carry Evan out of the plane and soon after Evan was in daddy’s arms and all of a sudden wide awake. We stayed at the J.W. Marriot. We really like its location. Close to one of the bigger malls and right in the middle of the city and with a shuttle service to that mall. 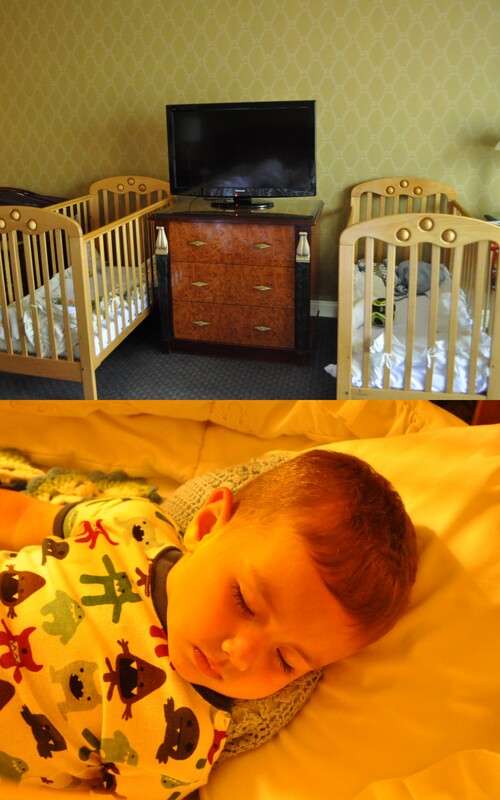 We asked for two cribs and they were glad to let us borrow both. We had access to the executive lounge and that makes the trip easier. We don’t have to go to the big restaurant for breakfast and it’s much easier to control Evan in a smaller area. We did go downstairs most of the time, but we had the option of going to the lounge just to change the scenery. The breakfast is excellent and everything is cooked and baked fresh that day. One of my favorite things is the fresh tropical fruit juices. 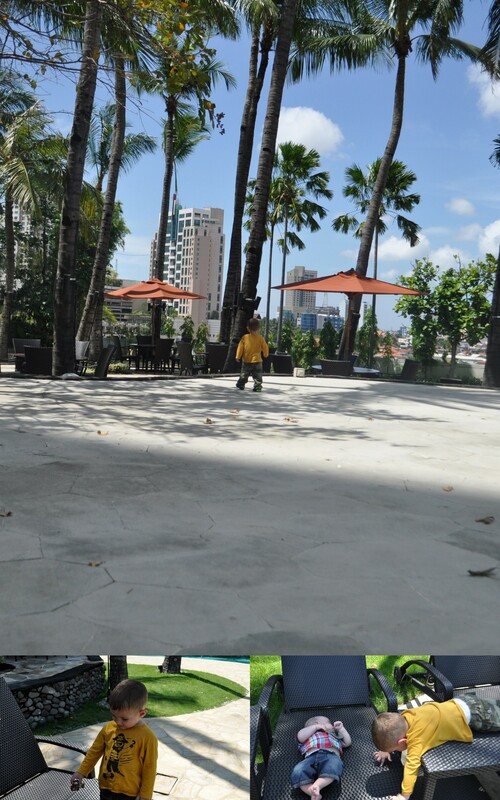 Our preferred area in the hotel is the pool area. The pool is gorgeous and it’s always very warm. Right by the pool there is a huge lawn where I usually play soccer with Evan. The best part of this hotel is the staff. Everyone is so nice and caring. Evan was well known in the different areas in the hotel and that made a huge difference. Especially that one time when he fled out the door and into the elevator. I went down to the lobby and I was happy to find him with three of the guards waiting for me. On several occasions he fell asleep in the taxi and they helped me carry him into the room as I had my hands full with Joshua. For my husband’s birthday the management gave him a delicious chocolate cake. What else could we ask for? We were later looking to celebrate his birthday at a nice Japanese restaurant and all the best reviews led to Imari Japanese restaurant which was on the second floor of our hotel. 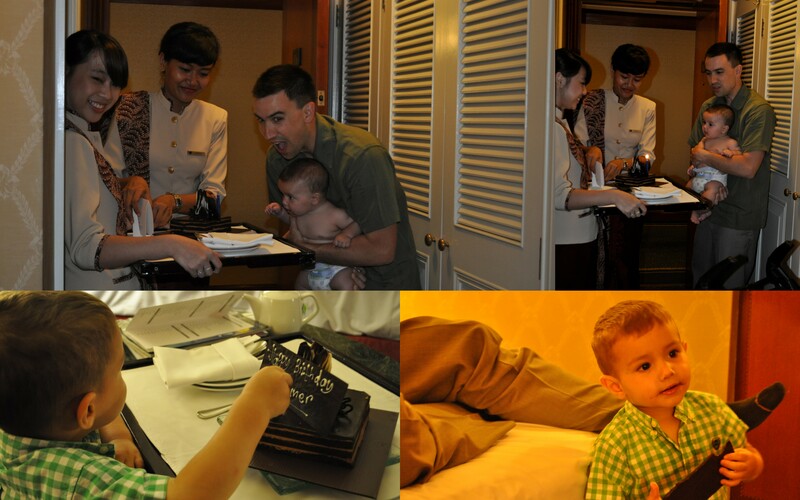 For his birthday, the chef brought a special dessert tray with delicious Japanese sweets. I can say that the Marriot in Surabaya is our second home in Indonesia.